Turn your PDFs into DOC documents you can edit. PDF2DOC converts PDF files into Microsoft DOC documents. PDF2DOC preserves the text, layout and images of your original document. Microsoft Word is one of the most widely used programs to create documents that may contain any text and even graphic information and used for the variety of purposes. Word documents are the easiest way to handle and change the information so when you get a PDF document, the only way to use the information that is contained in it apart from reading it is to convert PDF document to Word. VeryPDF.com Inc. is ready to provide you the software to convert a PDF to Word document very easily and in no time. PDF2DOC instantly converts PDF files into Microsoft DOC documents that look just like the original - complete with all formatting and images! Information is set free - free to be edited and free to be integrated into your documents. 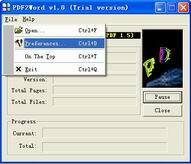 In converting PDF to Word, VeryPDF PDF2DOC keeps the page layout and formats of your original PDF. You can then edit (copy, paste, modify) the content of your PDF in Word and other Office applications. PDF2DOC software is a standalone program and does not require Microsoft DOC, Adobe Acrobat, or even Acrobat Reader. PDF2DOC is a batch PDF Converter that you can convert a lot of PDF files to DOC documents once time! saving your time! PDF2DOC is a standalone software, MS DOC, Adobe Acrobat and Reader NOT required! Reuse the Images - Copy, edit and paste images from your PDF to other applications. VeryPDF PDF2DOC will extract images into your Word document. You can then modify and reuse the images as you choose. If you need to turn your PDF files into documents you will be able to edit, evaluate all the benefits of convert PDF to Word document solution by VeryPDF.com Inc. Whether you are looking to boost dramatically your productivity or just introduce the most innovative and latest technologies in file conversion, be confident to choose VeryPDF's PDF to DOC Converter as your reliable file conversion PDF to Word software tools.